The best time to invest in cryptocurrencies was 10 years ago and the second best time is NOW! Statistically, most of the cryptocurrencies are at a 3 year low, making it almost the optimal time to invite new traders. At XDAT, we are on an optimistic intent to empower the crypto community by increasing the influx of users who want to trade in cryptocurrencies. You can earn up to €2000* only on XDAT!! Are you an individual who wants to trade or know at least 5 users who are interested and willing to trade crypto on a secure and easy platform? Avail a once in a lifetime opportunity to become a ‘Node’ on XDAT. 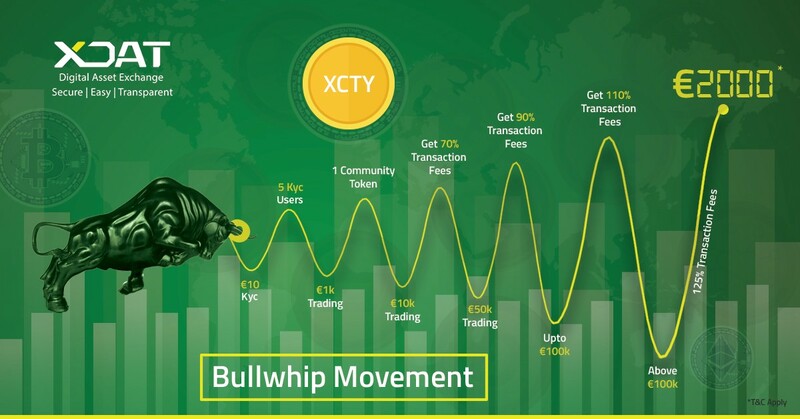 We are lining up comprehensive incentives for KYC and Trading, for every distinctive move you make! We believe in mutual growth, only when YOU grow, can WE grow. XDAT is taking giant leaps to cater to mass adoption across nations reducing barriers on crypto trading and investing, by adhering to compliant standards. We aim at garnering an ecosystem that transacts on a trustworthy exchange with maximum functionality for our users. XDAT has promising incentives lined up for all investors who trade and facilitate trade on our platform. Everyone has the opportunity to maximise their earnings when they trade. In return for your participation, apart from prioritising you for a Community Token, when you actively trade you have the ability to mint up to €2000*! Place your trust with XDAT, become a Node and be our ‘Knight of Trust’ to guide and create a crypto inclusive ecosystem. Whitelist yourself as a ‘Node’ Today! Hurry! Limited Nodes are available on XDAT! Before we run out of availability. Join the bandwagon of crypto ninjas and be a part of the leading edge of crypto adoption.